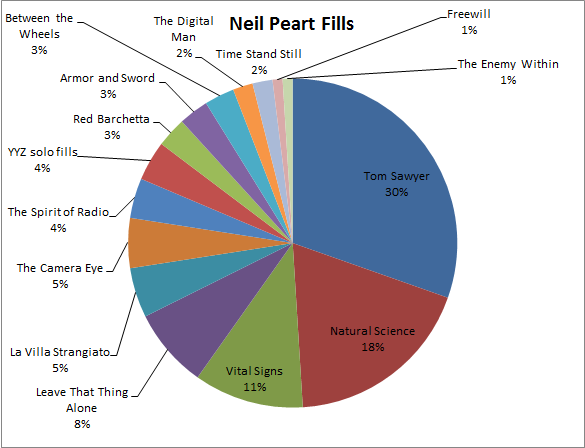 This survey was all about Neil Peart fills. I decided to open it up so people could add additional fills to the list. This made it more interesting, but also made it more difficult to count votes -- because I couldn't always tell which fill someone was referring to. Because of this, I had to drop some of the options people had added. Who can forget this drum-solo-within a song? The first fill is trickier than it seems (if you watch the Archives studio video, Neil actually skips a tom on the way down). The second is the famous "quadruplet" with a triplet feel. This was the big surprise -- as I didn't have this on my original list (but it should have been). This is the kind of fill that happens so fast, you're left wondering what just happened. I had to slow it down to really understand what was happening. Neil would go on to use this same approach for solo fills in songs like "YYZ" and "Leave That Thing Alone." If you're looking for more about what Neil's playing here, I recommend watching Ray Harber's lesson on "Neil Peart's four note grouping." The part about the "Natural Science" fill comes in around the 7-minute mark. This has always been one of my favorite fills because of the level of excitement it brings to the song. Here's what Neil Peart had to say about "Vital Signs" and this fill in his article, "Notes on the Making of Moving Pictures." Conceptually, this song was an attempt to bridge the gap between the primal appeal of the rhythmic reggae "bounce" and the electronic energy of high-technology music. As a drummer, this gave me the opportunity to begin as a simple "groove" player, and then grow through various developments into the "overplaying show-off type" toward the end! I drew on many influences throughout this progression: notably the works of Creme and Godley, Ultravox, The Police, the great things that Michael Giles did with early King Crimson, a healthy dose of good old hard rock, and a little Caribbean influence. Here's a version of "Vital Signs" with isolated drums. You can really hear how much they tweaked the drum and cymbal sounds.